What’s for dessert tonight? How about trying our calcium-rich easy rice pudding recipe (riz au lait)? Riz au lait is a classic old fashion simple French dessert. Made of milk, sugar, and rice, rice pudding is nutritious and very satisfying. In fact, in the old days, a big bowl of “riz au lait” for supper would be just what children needed for their growing bones and to get ready for a good night sleep. This easy rice pudding recipe also makes a wonderful snack and is a delicious way to get your dose of calcium. And you can also make this easy rice pudding recipe ahead – so good chilled the following day. Check our detailed easy rice pudding recipe and Art of the Home suggestions below. Enjoy and bon appétit! In a large pot, pour milk and add in sugar and vanilla sugar (or vanilla extract). Bring to a gentle boil stirring from time to time. Sprinkle rice in the pot while stirring and cook under low heat for 45-60 minutes — rice pudding needs to be cooked slowly. It’s also very important to mix from time to time and scrape the bottom of the pot to remove rice that may be sticking but not too much stirring though! After about 45 minutes, taste to confirm the rice is well done. If the rice is still al dente, cook a bit more. At the end of cooking, there will be milk left but that’s normal, most of it will get absorbed by the rice when it cools off. This will plump up the grains of rice and make your “riz au lait” that much better! Cover and let the rice cool off at room temperature. You will need at least a couple of hours. Delicious chilled but you can also enjoy it at room temperature. 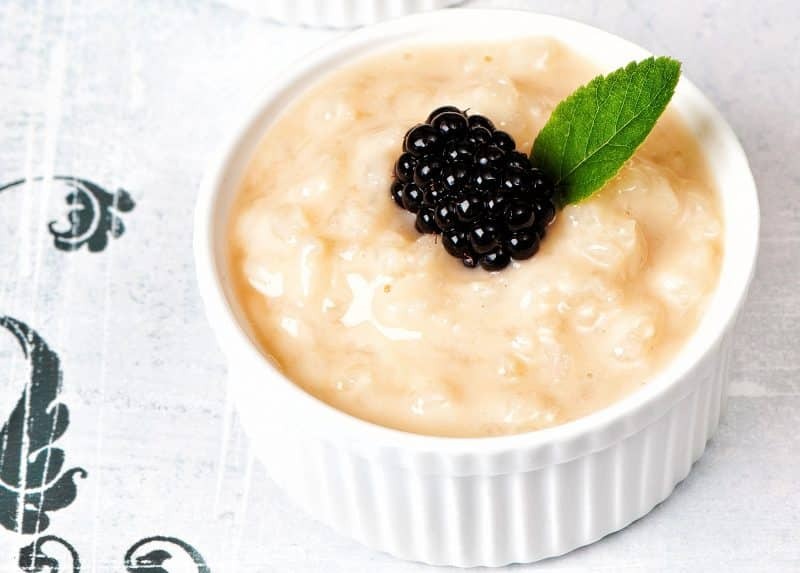 Easy rice pudding recipe with fruits: Add a blackberry (or any other berry) and decorate with a mint leaf. You can also mix in dry fruits such as raisins. Easy rice pudding recipe with spices: sprinkle with cinnamon or coco powder. Easy rice pudding recipe with less sugar: our easy rice pudding recipe calls for lots of sugar – this is the traditional recipe – but sugar quantities can be lowered as needed if you are on a sugar restricted diet. You can also use a sugar substitute. Portion control: consider serving your rice pudding in ramekin — it looks pretty and it’s a big help in making sure we don’t overeat. Enjoy!